The Fujikawa Maru was built in 1938 by the Mitsubishi Company as passenger/cargo carrier for the Toyo Kaiun Line. Her peacetime duties consisted of carrying raw silk and cotton between South America and India. The Japanese Navy took control in December 1940 converting her to an aircraft ferry. As part of her conversion she was fitted with six inch guns at bow and stern. These guns were from the Russo-Japanese War and had been “cannibalized” from decommissioned cruisers. The breech plate on the forward guns displays an 1899 manufacture date. Just prior to ‘Hailstone,’ Fujikawa Maru had arrived in Truk and off loaded thirty “Jill” B5N2 bombers onto Eten Airfield. Since these aircraft had been disassembled for shipment, they were unable to help defend Truk and were destroyed on the ground. The Fujikawa Maru was sunk by a single aerial torpedo striking amidship in hold 4, opening to the engine room and causing the eventual sinking . Although the torpedo failed to run properly, its momentum carried it into the ship to detonate. 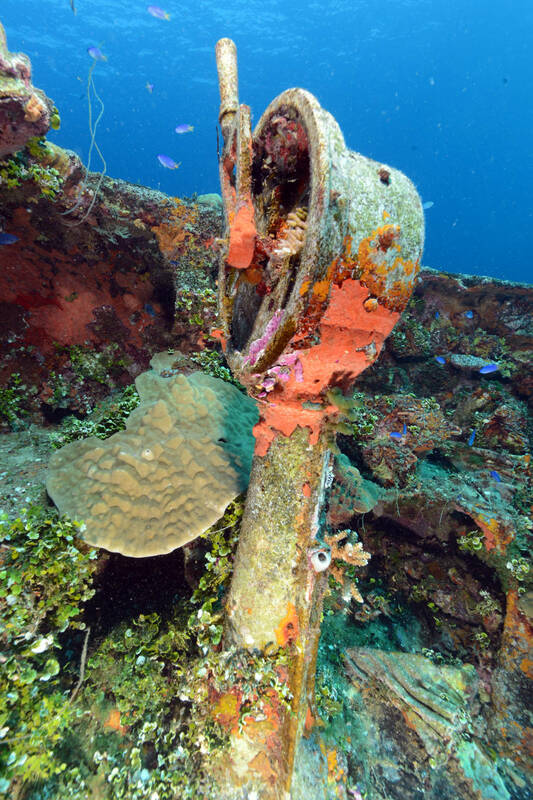 The Fujikawa Maru has long been a favorite amongst Truk’s “Ghost Fleet”. Her magnificent guns, Japanese bathtub and the Zero aircraft still in her hold, make her a “must see” wreck lying on a 120 fsw floor. Launched: 15 APR 1938. Crew: 48.